The DGA Tsunami - RDGA Line is an ultra overstable fairway driver disc golf disc. It was designed for fairway drives that require predictable and accountable fade. The Tsunami is a perfect complement to its understable cousin, the Undertow, and will quickly become your safety blanket once in your bag! Great for both side arm and overhand throwers. 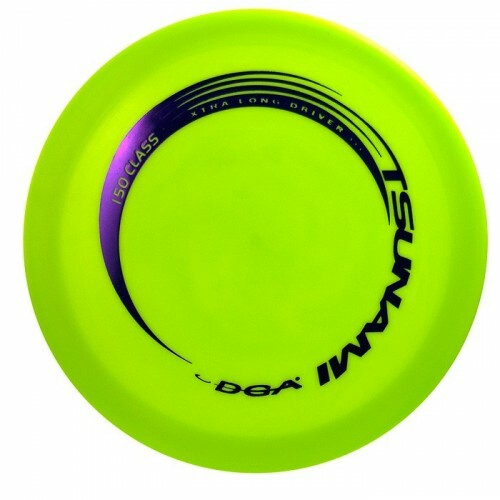 The Tsunami is ideal for players looking for a disc with consistent fade and predictable turn. The Tsunami in ProLine plastic will have superior grip and will achieve its intended flight characteristics earlier in its lifespan than the SP Line plastic. Features -- Very overstable fairway driver. Predictable finish. Increased fade. 21.4 cm diameter. Rim Width 1.9 cm. Rim Depth 1.2 cm.